OFW-SG KABABAYAN! 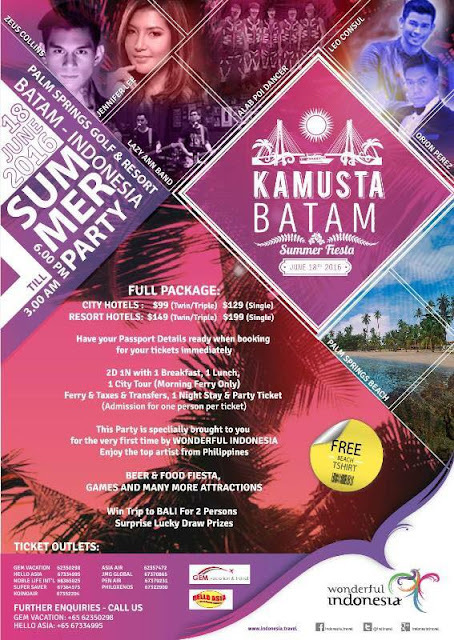 You are invited to KAMUSTA BATAM Summer Fiesta! ENJOY Beach Wear/Bikini Competition, Concert Events (Invited Pinoy Artists), Beer and Food Fiesta, Games, Lucky Draw and more! *Includes 2D/1N with 1 Breakfast, 1 Lunch and 1 City Tour (Morning Ferry Only). *Plus Ferry and Taxes and Transfers, 1 Night Stay and 1 Party Ticket with 1 Free Beach T-Shirt! BOOK NOW for a chance to win trip to Bali for 2 persons!